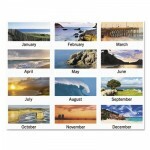 A tranquil seascape image shown each month. Durable backboard for sturdy writing surface. Features full-color, wide-view photos. One month per page with unruled blocks and lined notes space. Full-year calendar reference; Federal holidays highlighted. Includes calendar in holder and three planning pages.